UNIOSUN Pre-Degree Supplementary Admission Form 2017/2018 is Out – pds.uniosun.edu.ng. 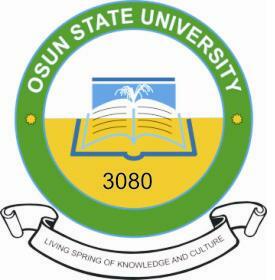 This is to inform the general public that the Osun State University (UNIOSUN) 2017/2018 academic session pre-degree programme supplementary application form is out and available for sales. Read the full details below. UNIOSUN Pre-Degree General Admission Requirements. How to Apply For UNIOSUN Supplementary Pre-Degree Form. Candidates are to register on-line by accessing the University website: http://www.uniosun.edu.ng or directly on the Pre-Degree Portal at http://pds.uniosun.edu.ng to complete and submit Application Forms. Candidates are also expected to print two (2) copies of the application form after submission. Each candidate is to bring along a copy of the application form on the day of the screening exercise. The second copy is to be submitted on admission to the University. UNIOSUN Pre-Degree Admission Form 2018/2019 is Out – pds.uniosun.edu.ng.